Ideas For Container Gardening with the name of each flower labeled. Click photos to open enlargements in a new tab or window. Move between arrangements with the arrows at the end of each description. Click to see the recipe for this and 19 other amazing looks, plus care advice. 25 wonderful container garden designs, with recipes and flower labels added! Recreate these beautiful container flower garden designs on your patio or porch, each with full recipes and labels. Learn the names of flowers in these stunning container designs. 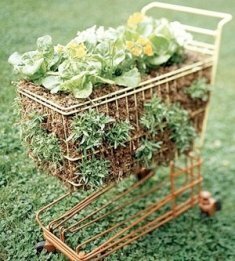 Click to see 20 recycled places to to grow flowers, herbs, veg and salad! Ultra-cute Fairy Flower Garden ideas. Even boys can get a kick out of their own "monster" garden (you don't have to use the 'F' word!). Click any of the images below to see a fully labeled description, complete with plant identities, so you can get the same container look for yourself! Zinnias and Gazanias in a strawberry pot. Like this page? Please click here to leave a comment! Red for danger? Not here! Cordyline, Gazania, Verbena, Salvia, Vinca Minor, Calibrachoa make a "show stopper"! All Photos used under a Creative Commons licence with the kind permission of Daryl Mitchell and Flickr. Other individual photographers are also credited on the pages which open up when you click. Here's why. I've caught myself dreaming up combinations before when I'm trying to find my next set of design ideas. Container gardening flower choices are UNLIMITED, though! Where to start, what to choose, how's it going to look? I then inevitably head toward a container gardening magazine and start there. 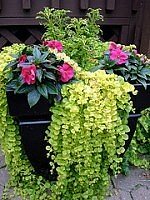 Photos are such great stimulation for the old brain, and gardeners who make it to that magazine can usually put together a pretty good list of ideas for container gardening. Did you enjoy that? We loved bring it to you. 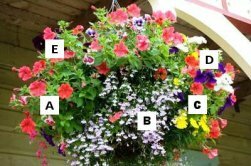 We took the trouble to label those container gardening pictures, because on most other sites, images aren't labeled with what makes up the design. I'm left trying to figure out what that peculiar looking plant is in the back, or left wondering... "What is that making up that centerpiece?" 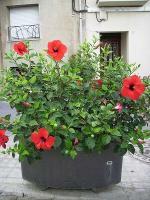 Please do click to share your own container garden design ideas. I can't wait to read YOUR great ideas for container gardening! What's even better than buying organic food? Growing your own in containers! We show you all you need to know to grow potatoes, salad, tomatoes, Brussel sprouts, pumpkins, asparagus, and much MORE. 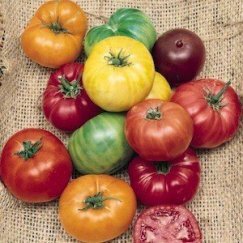 Escape the GMO trap, and do your bit for future bio diversity, by insisting on only organic heirloom seeds for planting your container garden. You will be delighted by the taste and appearance of long-forgotten varieties of your favorite fruits, veg and flowers. Did you enjoy this page? Please click here to leave a comment! Share Your Pictures of Flowers in Containers! Have a beautiful Container Garden Picture, and a tip or two on how you grew it? Share it with us, we would love to see and read about it!! Enter The Title of Your Container Garden Photo. For example, "My Big, Amazing Petunias!" Container Flower Gardening Ideas: Marine Heliotrope, and Tiger Lily? 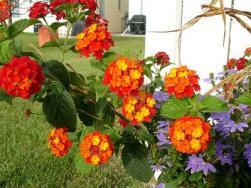 Container Flower Gardening Ideas: New Wonder Blue Fan Flower, Lantana? Here is the new container at our front door. I think my wife did a great job on this 50 lb planter. It took 24 4.5" and one 6" plant.